In this shocking memoir from a former corrections officer, Gary Heyward shares an eye-opening, gritty, and devastating account of his descent into criminal life, smuggling contraband inside the infamous Rikers Island jails. Gary Heyward’s life changed forever when he received a letter from the New York City Department of Corrections announcing he was accepted into the academy for new recruits. For the Harlem-born ex-Marine, being an officer of the law was the ticket he’d been waiting for to move up from a low-wage security job and out of the Polo Ground Projects in New York City—and take his mother with him. 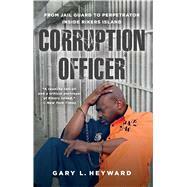 Heyward was warned of the temptations he’d encounter as a new officer, but when faced with financial hardship, he suddenly found himself unable to resist the income generated from selling contraband to inmates. In his distinctive voice, Heyward takes you on a journey inside the walls of Rikers Island, showing how he teamed up with various inmates and other officers to develop a system that allowed him to profit from selling drugs inside the jail. Corruption Officer is a jarring exposé of a man having lived on both sides of the law, a rare insider’s look at a corrupt city jail, and a testament to the lengths we’ll go when our backs are against the wall.